Any girl who regularly attends church will say the Lords Prayer at church and in the home. This musical box has a personalised top (white metal) with the girls name on it and the Lords Prayer with images to help her to remember it. At first she can read the prayer off her jewellery box at night time before she goes to sleep. Once she has fully memorised it she can display it on a dressing table or side table. 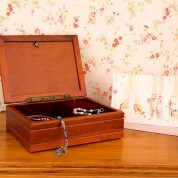 Inside the box there are several compartments suitable for storing her favourite jewellery inside: bangles, necklaces, rings and earrings. We sublimate print the piece of white metal in house so each design is custom made for each individual girl. Music: Plays a classical tune when opened (wind up mechanism is on the base).